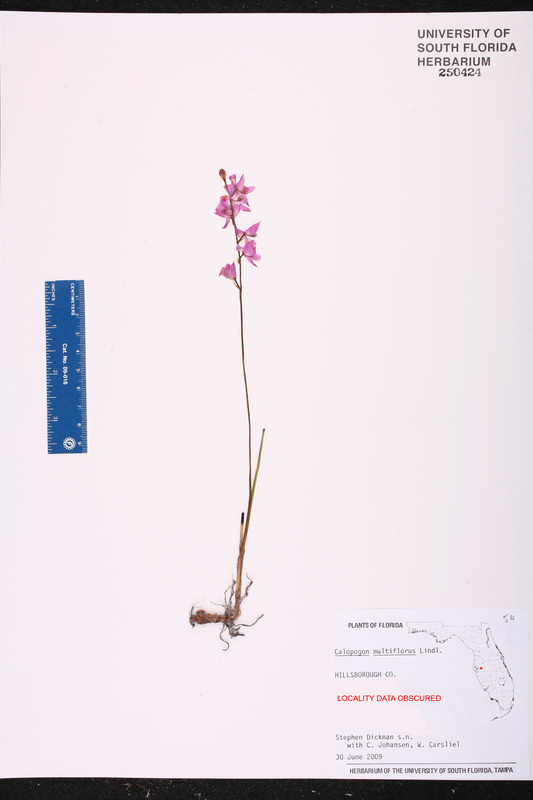 Citation CALOPOGON MULTIFLORUS Lindley, Gen. Sp. Orchid. Pl. 425. 1840. 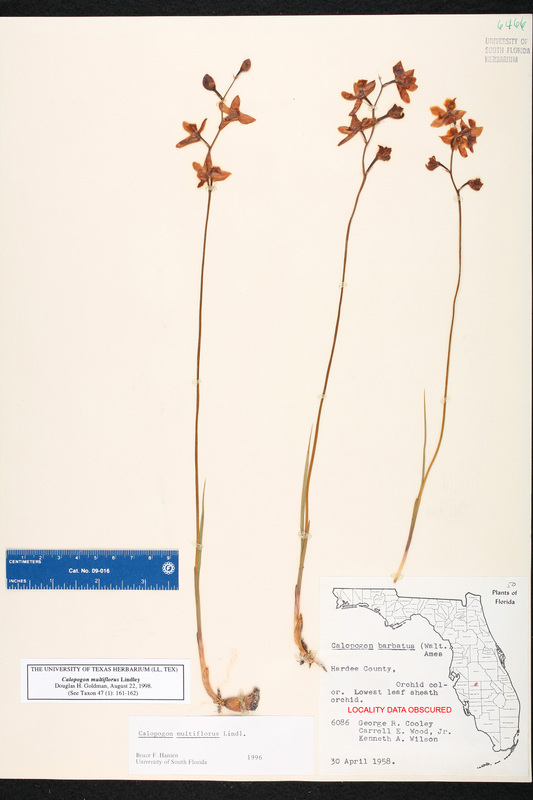 Type: FLORIDA: Without data, Cozzens s.n. 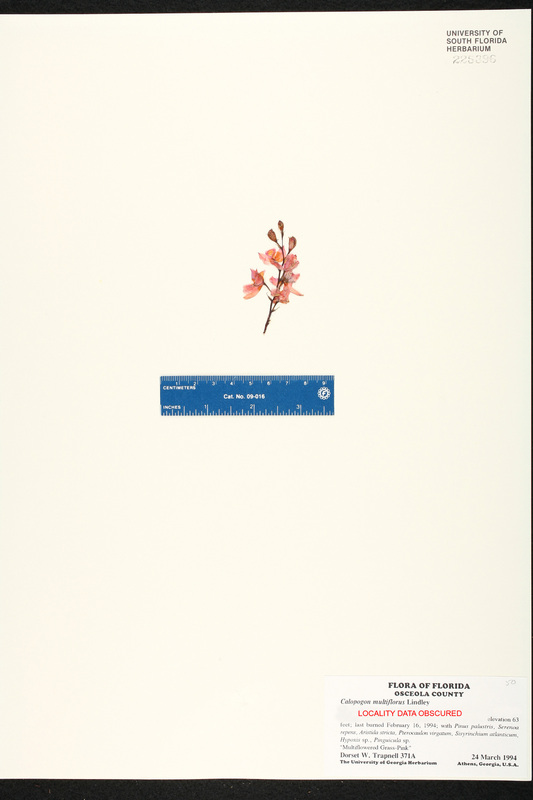 (holotype: K). Broward GH-Lit Lit-GH: D. H. Goldman & Orzell, Lindleyana 15: 240-241. 2000. Duval FLAS-Lit Lit-FLAS: D. H. Goldman & Orzell, Lindleyana 15: 240-241. 2000. Liberty TEX-Lit Lit-TEX: D. H. Goldman & Orzell, Lindleyana 15: 240-241. 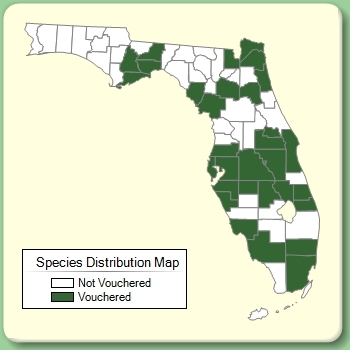 2000. Nassau GH-Lit Lit-GH: D. H. Goldman & Orzell, Lindleyana 15: 240-241. 2000. Polk USF-Lit Lit-USF: D. H. Goldman & Orzell, Lindleyana 15: 240-241. 2000. Putnam F-Lit Lit-F: D. H. Goldman & Orzell, Lindleyana 15: 240-241. 2000. Seminole NY-Lit Lit-NY: D. H. Goldman & Orzell, Lindleyana 15: 240-241. 2000. Wakulla GLAS-Lit Lit-FLAS: D. H. Goldman & Orzell, Lindleyana 15: 240-241. 2000. 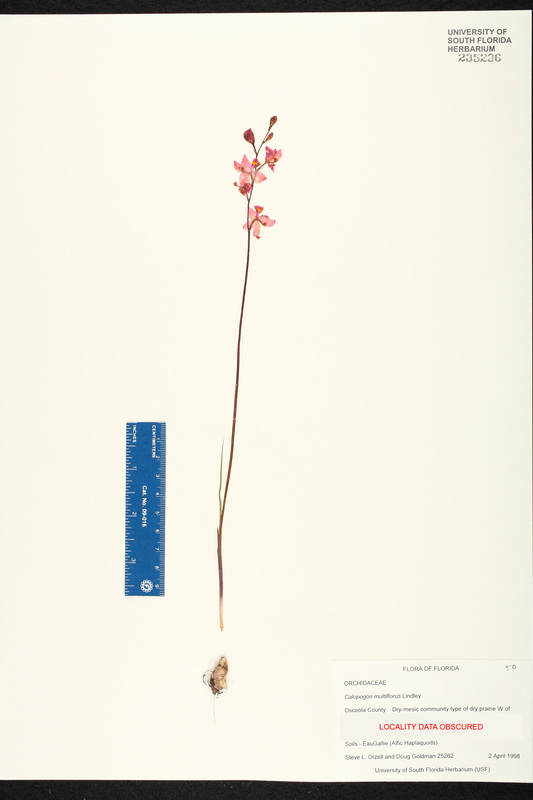 Calopogon barbatus var. 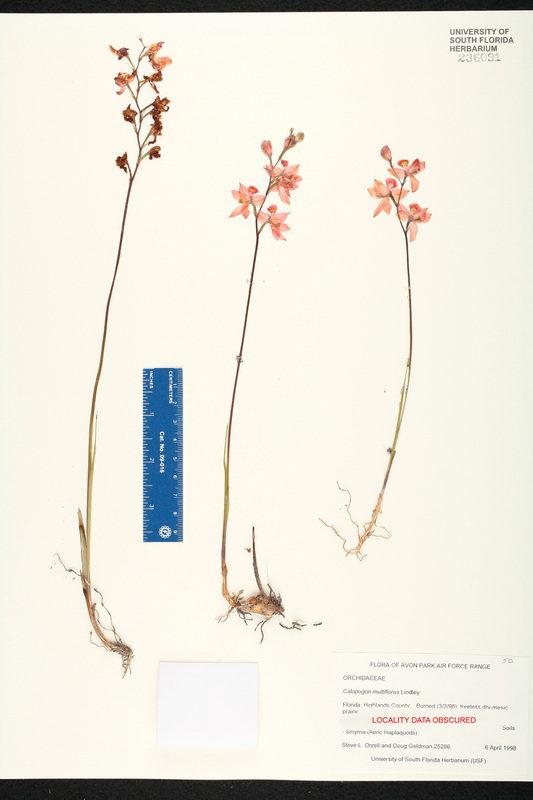 multiflorus Calopogon barbatus (Walter) Ames, var. 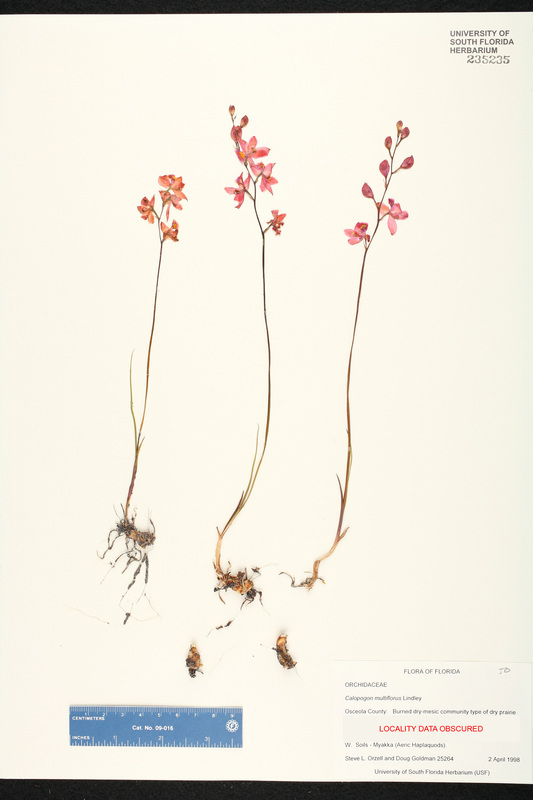 multiflorus (Lindley) Correll, Bot. Mus. Leafl. 8: 71. 1940. 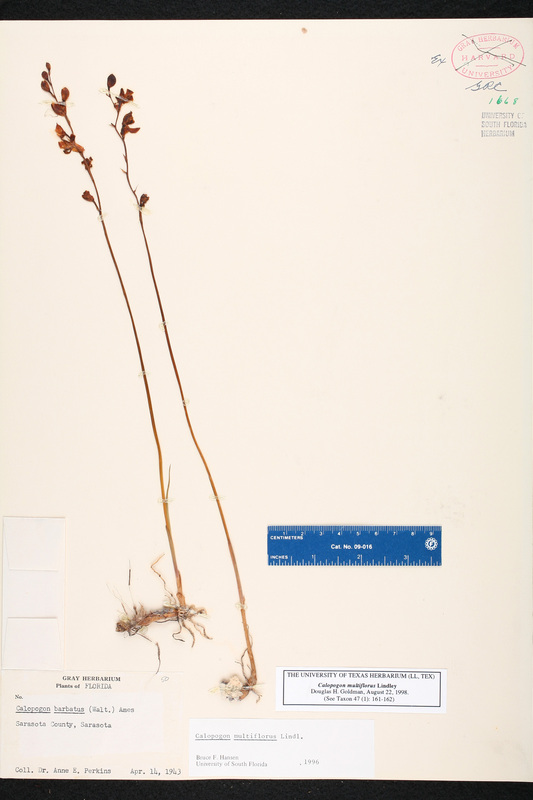 BASIONYM: Calopogon multiflorus Lindley 1840. 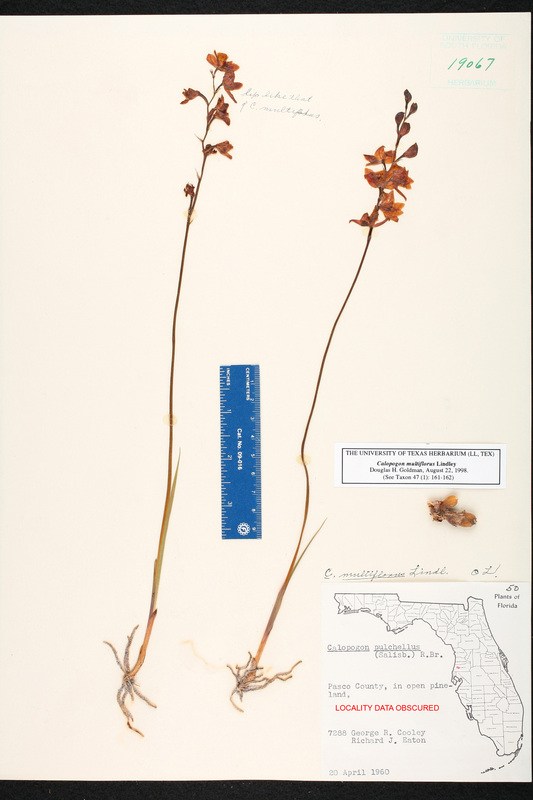 Calopogon multiflorus forma albiflorus Calopogon multiflorus Lindley, forma albiflorus P. M. Brown, N. Amer. 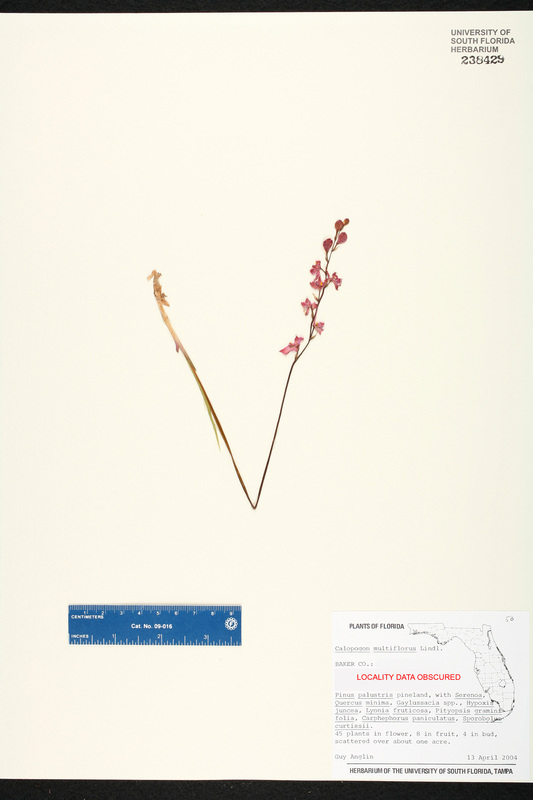 Native Orchid J. 10: 21. 2004. 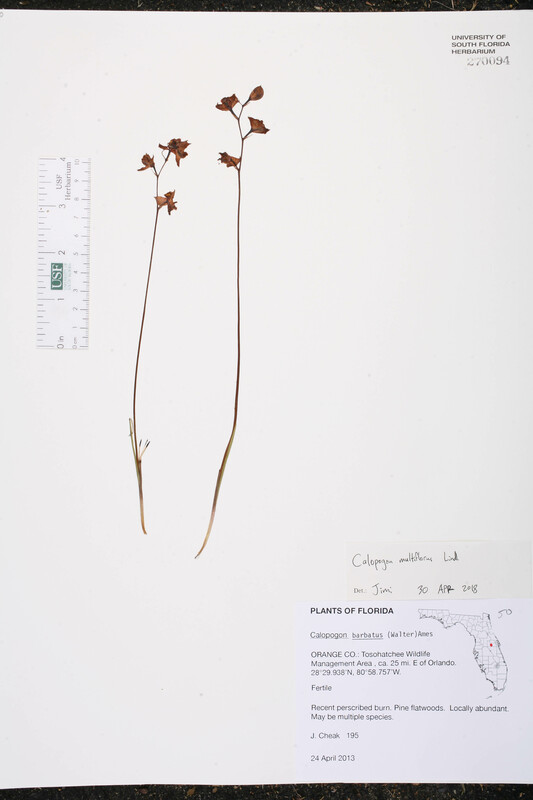 TYPE: FLORIDA: Levy Co.: Goethe State Forest, 10 Apr 2004, Phot. Brown s.n. 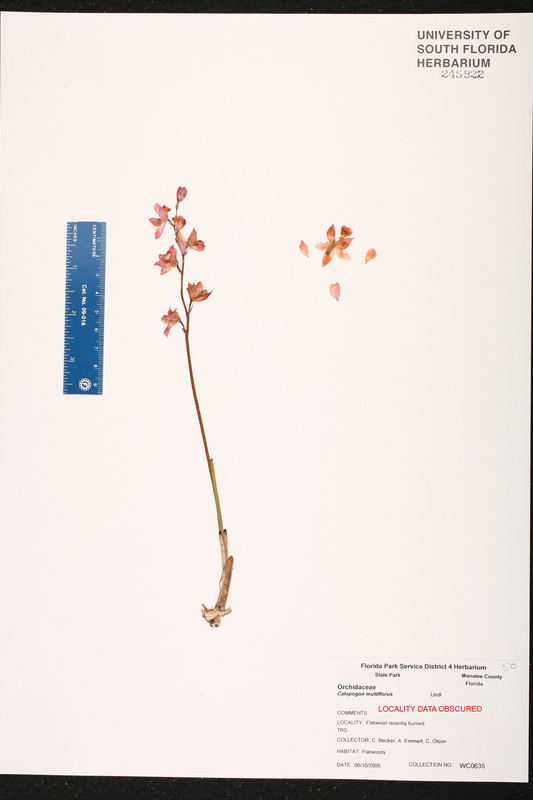 (holotype: N. Amer. 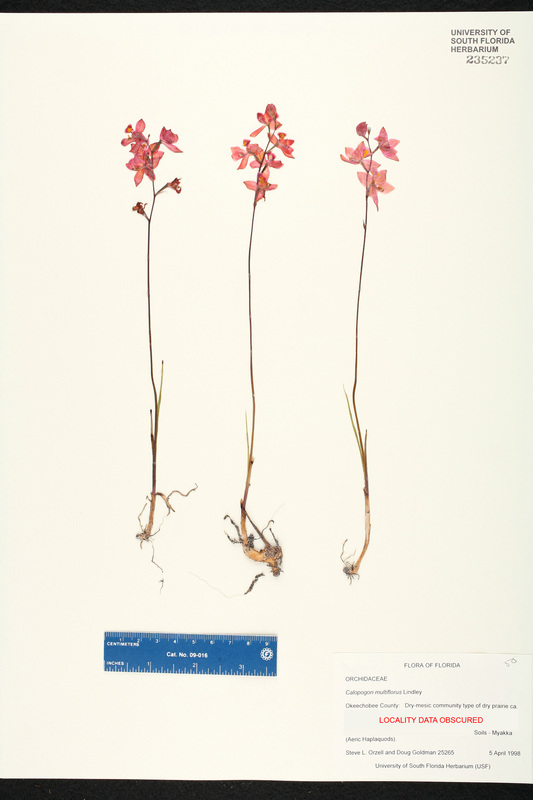 Native Orchid J. 10: 24, f. 1. 2004). Helleborine multiflora Helleborine multiflora (Lindley) Kuntze, Revis. Gen. Pl. 2: 665. 1891. 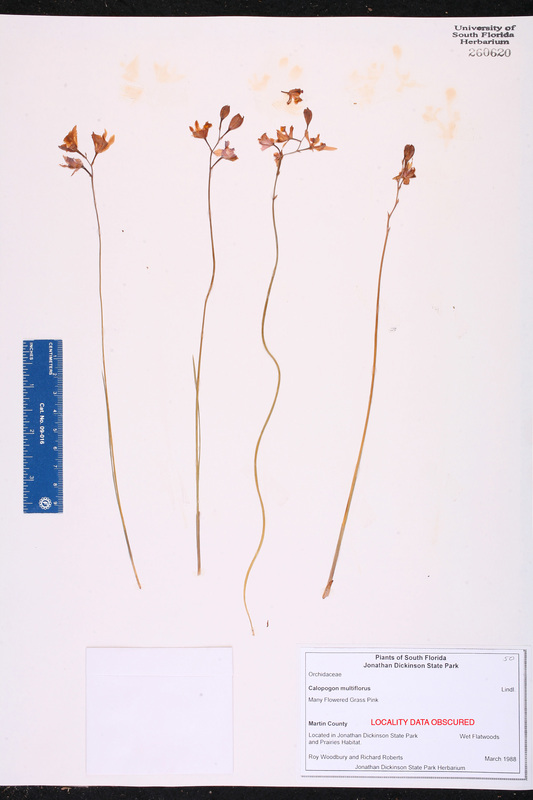 BASIONYM: Calopogon multiflorus Lindley 1840. Limodorum multiflorum Limodorum multiflorum (Lindley) Mohr, Bull. Torrey Bot. Club 24: 23. 1897. 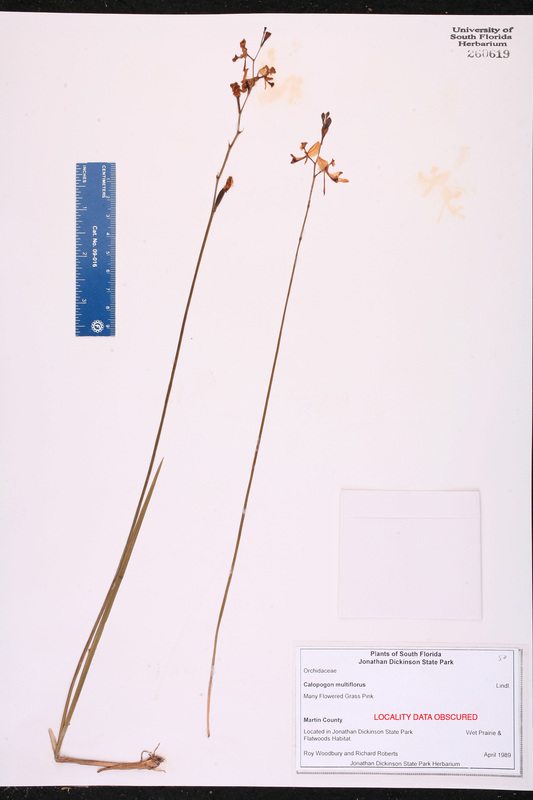 BASIONYM: Calopogon multiflorus Lindley 1840. Limodorum pinetorum Limodorum pinetorum Small, Bull. New York Bot. Gard. 3: 421. 1905. 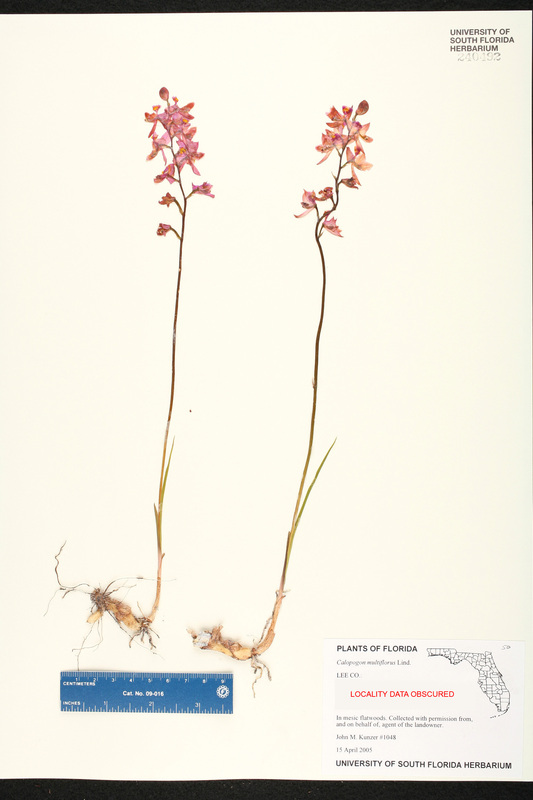 TYPE: FLORIDA: Miami-Dade Co.: Between Cutler and Camp Longview, May 1904, Small & Wilson 1676 (holotype: NY). USA Florida Baker Co. 13 Apr 2004 G. Anglin s.n. USA Florida Hillsborough Co. 30 Jun 2009 S. Dickman s.n.